OHIOPYLE, Pa. - The half-dozen parking lot attendants waving us in was the first sign we would have company strolling around Fallingwater, Frank Lloyd Wright's architectural masterpiece in southwestern Pennsylvania. True, the 1937 house at Bear Run is featured in all the travel guides for the region known as Laurel Highlands. But could a work of architecture deep in the woods be such a big tourist attraction? It turns out the answer is yes, and the Western Pennsylvania Conservancy, which has been running the site since the 1960s, has become highly organized in dealing with crowds: 120,000 visitors a year, 5 million in total thus far. Upon arrival at the circular main desk of polished blond wood in the wall-less visitors center, we received the telltale instruction: Take a number. Wait to be called for your group of 15 - probably about an hour, longer for parents with children, who must trade off because no one under age 12 is allowed inside. But a visit is well worth the wait, and as fans of architecture, we found it inspiring that there was so much interest in the design of this beautiful and unique house. Fallingwater and another Wright creation, Kentuck Knob, the I.N. Hagan house nearby, can be a centerpiece of a visit to this mountainous rural region, about an hour's drive from Pittsburgh. There are plenty of other offerings, including hiking and kayaking in Ohiopyle State Park, checking out antiques and flea markets, and taking in the rich history of the region, which is the site of General George Washington's early defeat at Fort Necessity, and also the country's first interstate highway. A somber additional destination is the temporary Flight 93 Memorial, some 40 miles away in Shanksville. Wright built Fallingwater in 1937 for the Kaufmann family, owners of a successful department store chain, as a weekend home along a river. The family assumed the home would be on the side of the waterway, but Wright fashioned a series of concrete trays that were cantilevered over the river, making the living areas at one with the gurgling water flowing underneath. The design blends exterior and interior, and an open floor plan for some parts of the house, and very private nooks for others. 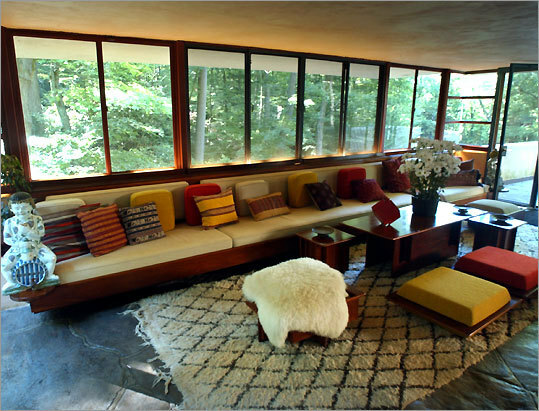 The history of Fallingwater includes salacious stories befitting such a landmark work of architecture. Wright initially scribbled the design in a few hours, was famously abrupt with his client, and much like some "starchitects" today, earned some scorn for basic structural and logistical aspects not working out well. The house sagged and struggled with mold, and over the years has had to be buttressed. The docents are honest storytellers, and moving through the rooms, one can't help but think not only what a work of art this place is, but how wonderful it would have been to live here, perfectly integrating comfort and high design. I ran my fingers along the cornered windows with awe, and spotted a copy of Architectural Forum on a shelf beside a stairwell. It was all I could do not to flip through it. The tour ends at the carport, guest room, and pool up above the main house, and then guests are free to walk around the immediate grounds, and to take pictures at the classic viewing point of Wright's cantilevered, symmetrical, vertical creation, in perfect harmony with nature. The visitors center includes an exceptional cafe, a great gift shop, and design-oriented things for children to do, like building their own cantilevered structures using little posts and tree-trunk slices. A few miles from Fallingwater, Kentuck Knob is a much less visited but fine example of Wright's sleek modernism and designing with nature. The L-shaped private residence burrows into a hillside with fine details such as skylights, the use of red cypress, sandstone, and glass. The carport and studio are nestled into the countryside - everything so incredibly tasteful and well designed, before the arrival of the split-level suburban mimicry of the 1950s and '60s. There is also a lovely sculpture garden. Getting around the Laurel Highlands requires a car, and driving the winding roads through the Allegheny Mountains is a pleasure. A certain dated Americana permeates the region. There's the Eureka Coal Heritage Foundation, the Big Mac Museum (the two all-beef patties allegedly debuted in Uniontown), and in Johnstown, the history of its devastating flood and the "world's steepest vehicular inclined plane - Johnstown's most unique tourist attraction." Historical sites run from Fort Necessity to Bushy Run Battlefield from the French and Indian War, and the first federally financed interstate roadway, "the road that built the nation," Route 40. Otherwise the visitor economy includes paintball, animal parks, roller coasters, the ubiquitous caverns and caves tours, and haunted houses. On one trip, we stopped at an old-school, family-owned zoo, where the boys fed bears by dropping treats down a tube. On another, after winding past silvery waterfalls amid the pines, we observed another use of the cascading rivers and waterfalls: the practice of sliding down chutes of slippery rocks, as if on a luge. This is done fully clothed; only rookies do it with skin exposed to the rocks. In these woods, everyone continues to design with nature in their own way. An exceptional experience for a museum cafe. $5-$12. About as good a wine list to be found. $7-$36.